We woke up around 7 (which is very early for me) to get ready and have some breakfast, even though I’m generally a brekkie skipper. The hotel provides a decent breakfast for guests for free. After the massive breakfast I had to resist the desire to get back in the bed. I took out my folding bike from the soft-shelled carrying bag and repacked it with clothes and shoes that were unnecessary for the bike trip. When we checked out I sent them off to NC’s house in Tokyo. Our train, the limited express train, Shinano, departed Nagoya Station on time at 8:30 am. It was sunny and the air was clear so we could see that mountain-tops in the distance were already covered with snow as we traveled away from Nagoya city. In less than an hour the landscape completely changed as the train took us to Nakatsugawa. Our starting point, Nakatsugawa, was Nakasendo’s 45th post town from Edo (former name of Tokyo) located right in front of the mountain range at an altitude of 299m above sea level. If you are traveling to Edo it is the last stop before serious uphill sections of the road heading towards Kiso-sanmyaku and it’s the closest you can get by rail to famous Magome (post town). From the station an uphill mountain road gives the sense that you are at the piedmont of Mt Ena. We started preparing our bikes at the station. The Birdy was easy, taking less than 30 seconds to unfold but with the mountain bike it took probably 20-30 minutes to assemble and complete a personalized setup for NC. We headed off at around 10 am to the west side of the post town where traditional style buildings still exist, because I wanted to have Kurikinton, a traditional wagashi (Japanese sweet) made out of chestnuts. Kurikinton are a local seasonal delicacy available in the autumn months from September to December. 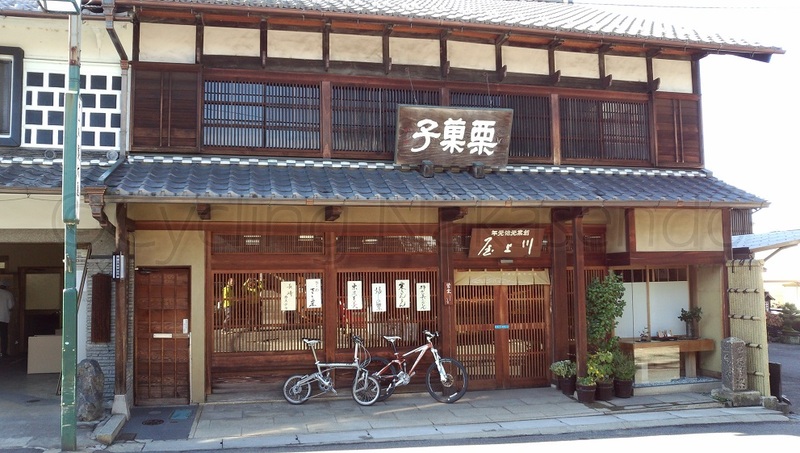 We went to the Kawakamiya wagashi shop I usually visit when I cycle along Nakasendo through Nakatsugawa. 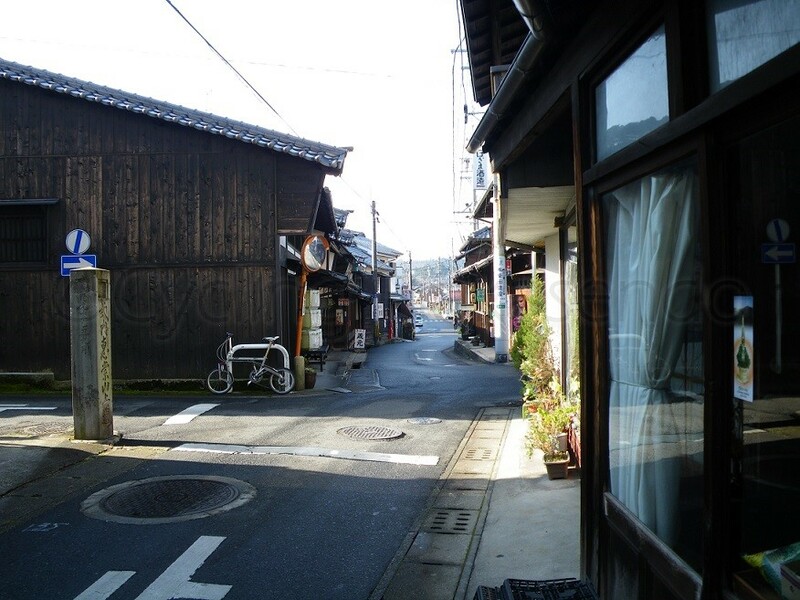 To find Kawakamiya one has to back-track along the old Nakasendo towards Kyoto. It is situated in small streets off the main road, right in the middle of a series of crank-like corners. These are called masugata, which literally means “shape of square” in Japanese. 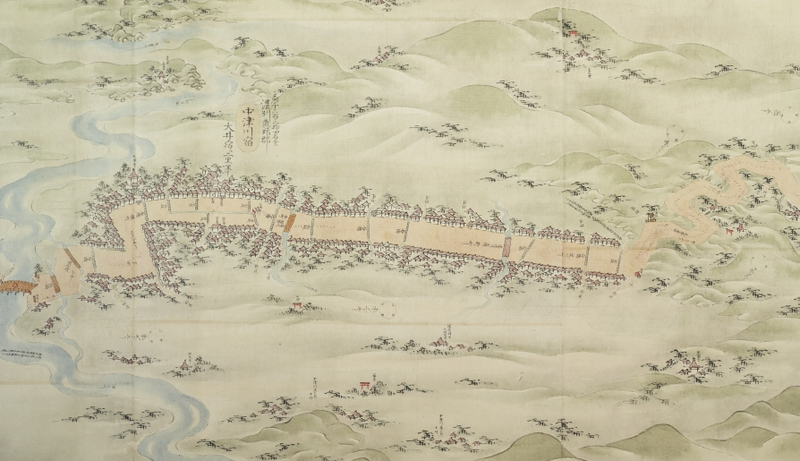 This road formation was used deliberately for defense purposes because, unlike the case with a straight street, it ensured that sections of the road are invisible from any given position and reduced the speed of invading enemy troops. Kawakamiya started business in 1864 and since then has continued to produce nationally renowned Kurikinton. Locally produced chestnuts and chestnut products were most likely chosen as a regional specialty gift for the Tokugawa shogunate during the Edo era as they were of the high quality often used in formal tea ceremonies. They were probably also served to clan lords and princesses when they had a tea break on their journey to/from Edo once every two years as they had an audience with the Shogun and fulfilled their obligation to serve him in Edo. Just like ordinary travelers in the Edo era (apart from the fact we were riding modern bikes), we pulled over at the charming, old Kawakamiya. The shop had just opened (just as I planned). I ordered two Kurikinton to have there and a box of 15 Kurikinton as a souvenir for my family to be shipped home. We had Kurikinton at a table in the store where they normally offer a cup of green tea. They apologized to us for not being able to do that because they were so busy making and packing Kurikinton ready to ship off for the end of the year gift-giving season. The lack of green tea was not an issue because the taste was still brilliant. The subtle and natural autumn flavor made me happy and energized for the coming long uphill ride of the day. We were also given Kurikinton Okoge (a cookie-like substance made from roasting the mashed chestnuts used to make the Kurikinton) which turned out to be more popular with NC than Kurikinton itself.